Let’s stick with the Star Wars theme, shall we? The photo is from The Trek BBS, a Star Trek forum. It’s Halloween, 1977. The poster says she took sketches in the movie theater and made the whole costume herself. Show me a sixteen-year-old who cared this much about The Phantom Menace. Are you listening, Disney? Totally, totally awesome. That’s some serious geeking out to take sketches in a movie theater (in the dark, even!) and then fashion the whole darned thing yourself. Wow. 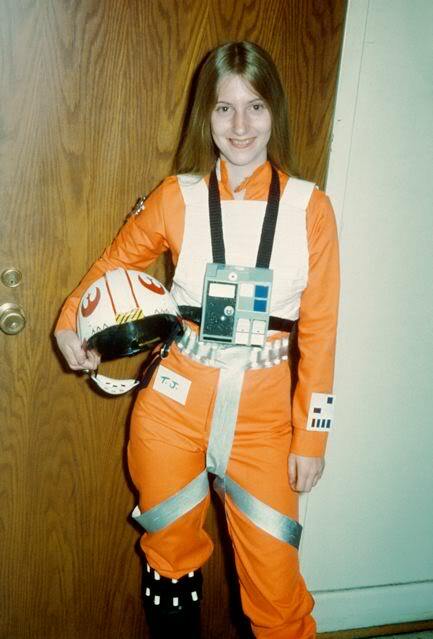 Even the pre-fab super-realistic modern Comic Con costumes (i.e., Speeder Bikers and TIE Fighter pilots) pale in comparison. Actually, there were a lot of kids dressed up as DIY Darth Maul, Queen Amadala, and DIY Jedi robes for Halloween 1999.